Bracelet and blouse are just so gorgeous!! You look amazing! Simple, colourful and elegant! Loving your top sweet pea! Love the zipper detail on those pants and the print in you blouse is amazing! I love that shirt so much! I would take if off your hands in a second! I absolutely love that top, it’s perfect with the simple white trousers! 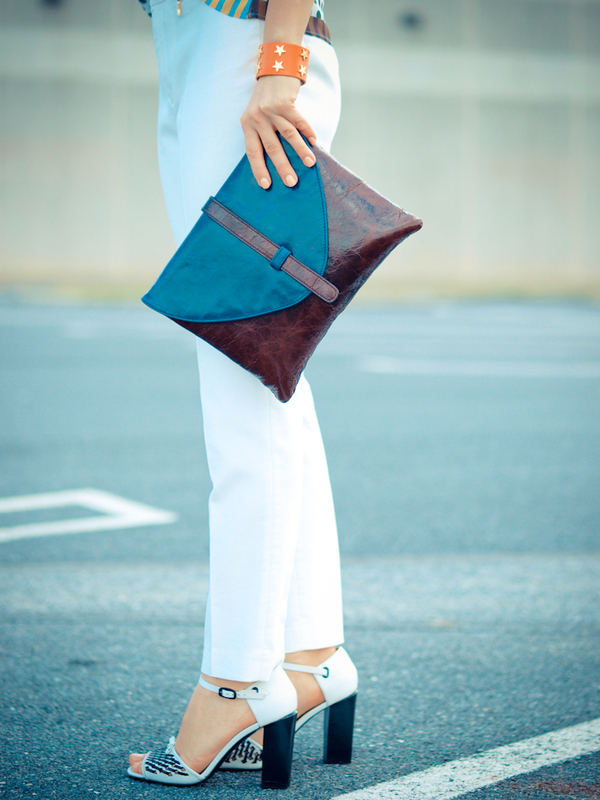 Love the clutch too! this outfit is really awesome!! Blouse and bracelet are beautiful. I love your blouse so so much! I love your shirt and your accessories are perfect. A great style. Love your Balenciaga lookalike shirt!!! Happy Easter to you too Veronica!!! In Greece we celebrate this weekend !!! Once more my lovely Veronica you are fabulous looking! I love the exaggerated print of the top and how smoothly is balanced out by the white crisp pants. 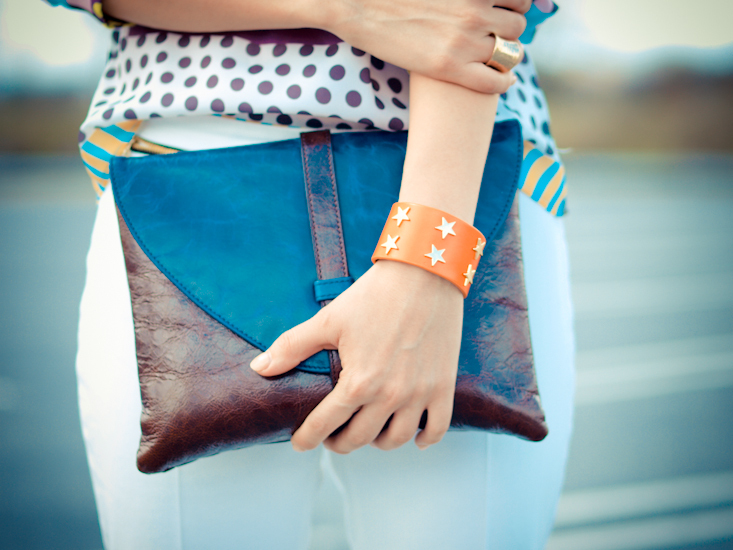 The star bracelet is so much fun too! Love the shirt! It’s fantastic! I love seeing your outfits! This blouse is too pretty. this top is very pretty! I love print so it! The print is amazing. I adore the clutch. the blouse is beautiful, love the prints! WOW! The fabulosity that is your amazing look is breathtaking! I love everything that is going on here. The styling makes my eyes shift around like they’re bouncing off colors. lol, but seriously, just great styling!! awesome sweater, very beautiful! love how t looks like with white pants. Love the top. Great outfit in general! Looove the blouse,it looks perfect with white pants! Such a great look! I adore the sunglasses! You need to stop being so darn beautiful. This look = perfection. Follow you ever like pleasure..
amazing pics and great outfit!!! Hello Veronica, happy day, beautful shirt and your pant and shoes is love it. Happy Easter Veronica and congratulations to the winner of your lovely giveaway! I simply love this colourful shirt and it’s perfect with a simple pair of trousers like the ones you’re wearing! Enjoy your holidays! You look amazing !! Love this look! That Top is so cool!! Love how you styled this look, gorgeous! Muy guapa Veronica! 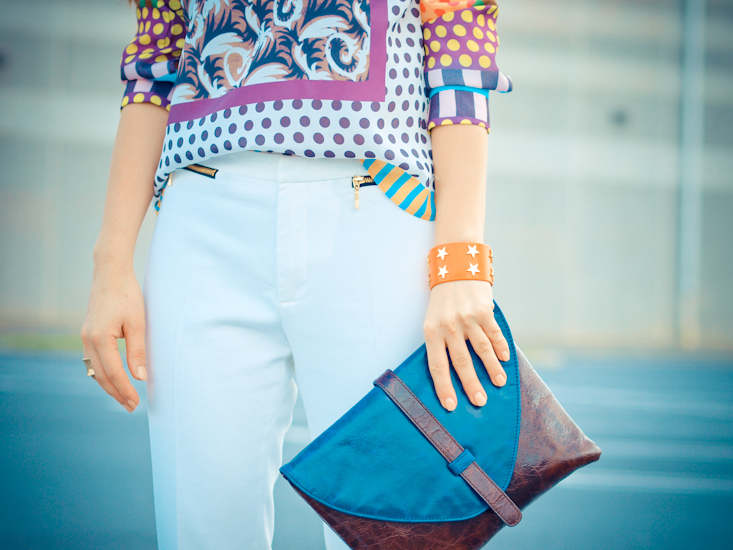 Me encanta el clutch! This shirt is one big WOW! It’s amazing, seriously attention grabbing and absolutely mind blowing! It’s super beautiful! You look gorgeous as always!Btw, I really like the clutch as well. I just love this colorful spring-ready shirt. You look lovely in this ensemble! Absolutely loving the mint base and that top! So stunning Veronica. love this shirt so much!! GORGEOUS! It looks like you walked straight off a RUNWAY! Omg! What a great outfit – printed blouse, white pants and amazing heels!!! You look so gorgeous!